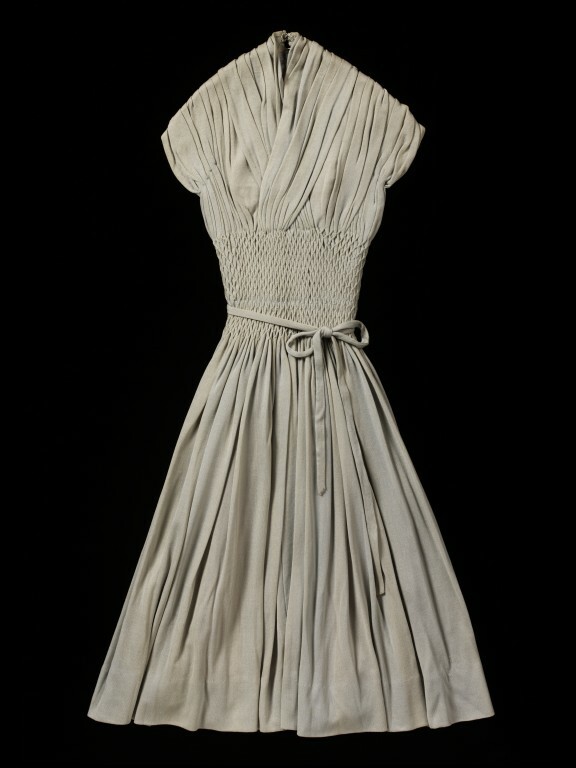 This is a quarter-scale couture reproduction of a late 1940s Jean Dessès dress. Dessès was renowned for his draped silk jersey dresses. This day dress appears simple, with its natural folds and smocked waist, but the silk jersey fabric required great skill to work with successfully. A fitted lining beneath the dress holds the fluid drapery in position. These scaled copies use the same fabrics and show the superb craftsmanship as their full size equivalents. The V & A have four of these miniature dresses which the donor acquired from the archive of the wholesale house of Dorville. Wholesalers would buy the copyrights to couture dresses so that they could sell modified ready-to-wear copies. It is thought that these quarter-scale dresses were sold alongside the patterns to show how the dress looked when made up. Miniature afternoon dress. Draped silk jersey in duck's egg blue, over tan sheath lining in silk jersey. Interior lining has darted, fitted and seamed bodice, creating structure to which outer drapery is anchored. Dress bodice features an extra, wrap-over layer of jersey, which forms a collar in the back and crosses over in front, eventually being incorporated with rest of fabric into smocked waist of dress. Back metal zipper with hook at top of zip fastener. Waist of dress, from just under bust, to just below natural waistline, tightly smocked in diamond pattern. Rouleau belt of jersey tied about natural waistline. Skirt very full and falling in smooth Grecian folds from smocked waist. Blue ink mark to back of skirt, near waist. Fabric slightly faded and discoloured in places with a brownish cast. Handwritten number on linen tape inside skirt. Given by David Sassoon of Bellville Sassoon Lorcan Mullany, who acquired these from the ready to wear house of Dorville in the early-mid-1970s. According to donor, these dresses were bought with the toiles by wholesale companies who copied and adapted these dresses for the ready to wear market. 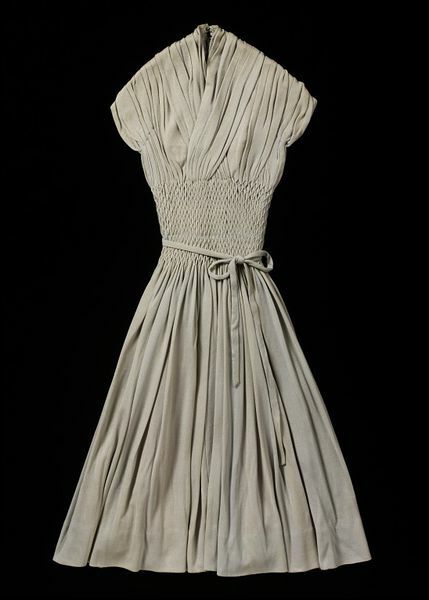 During the post-war fabric shortages, items such as this would have provided a way to show a wholesale-purchaser what the dress looked like without the expense of making a full-size dress with all the attendant usage of fabric. The ready to wear houses and representatives would buy couture models to reproduce and copy. 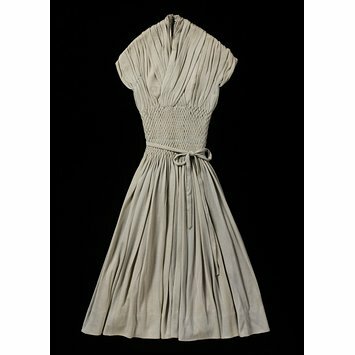 An early theory was that the dress was intended for the Théâtre de la Mode travelling exhibitions (of 1944 and 1946),but didn't make the final cut. Théâtre de la Mode was intended to show the world that Paris still had mastery over dressmaking and couture, and featured quarter-scale dolls dressed in the very best miniature garments that Paris could procure. A connection is unlikely, as while the dress demonstrates superb couture craftsmanship and perfect miniature scaling, it does not appear it would fit one of the very small-waisted Théâtre de la Mode mannikins, making the theory unpalpable. The Maryland Museum, who own the 1946 Théâtre de la Mode mannikins, have confirmed that these objects are not connected to the Théâtre de la Mode. What is clear is that they are amazingly well-made, beautifully hand-finished, exact scale models of couture dresses, using the same fabrics as their full size equivalents.